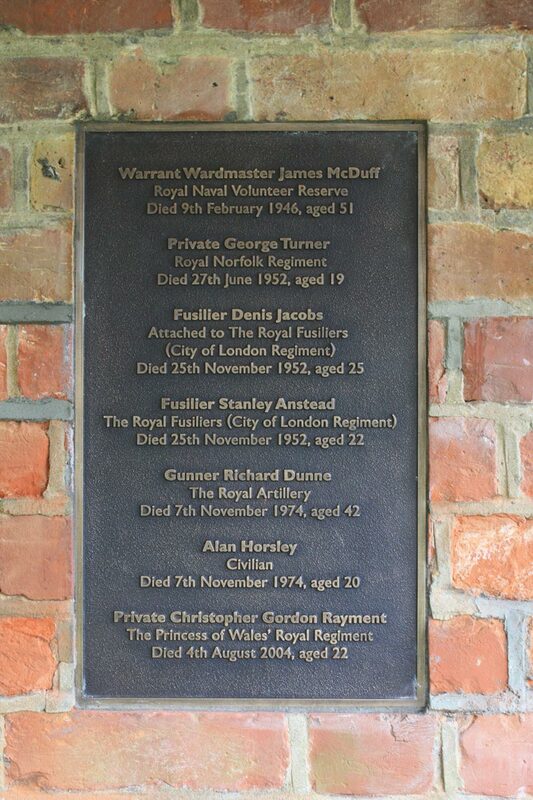 Julie Ricketts, Heritage Project Officer for St George’s Garrison Church, Woolwich will be giving a presentation to the Shooters Hill Local History Group on Thursday 18 February at 8pm at Shrewsbury House, Bushmoor Cresent, Shooters Hill. Julie will be covering the Garrison Church’s past and present and discussing plans for future events as well as volunteering opportunities. It’ll be interesting to hear about what’s planned for St George’s. They have recently appointed a board of trustees to be responsible for the church and the area of land around it as far as the Second Boer War memorial on the corner with Woolwich New Road. 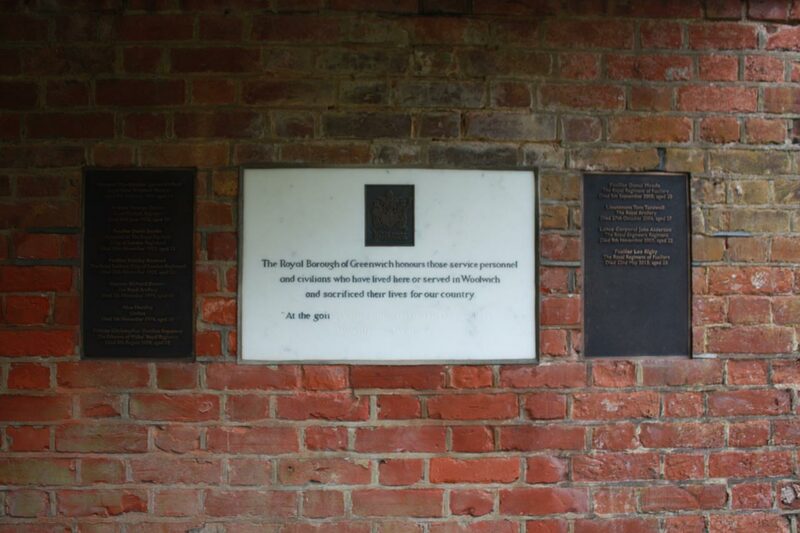 The board will be chaired by Tim Barnes QC, champion of many Greenwich causes: he was chair of the Greenwich Society and the St Alfege’s restoration appeal and is currently also a trustee of the Greenwich and Bexley Community Hospice and chair of the Friends of Westcombe Woodlands. 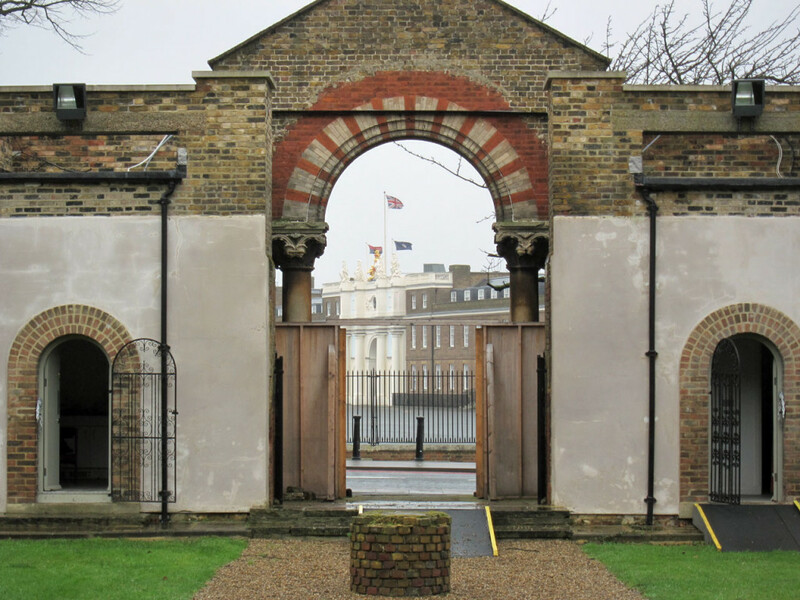 Other trustees include the Bishop of Woolwich, the officer Commanding the Woolwich Barracks and Woolwich Common councillor David Gardner. 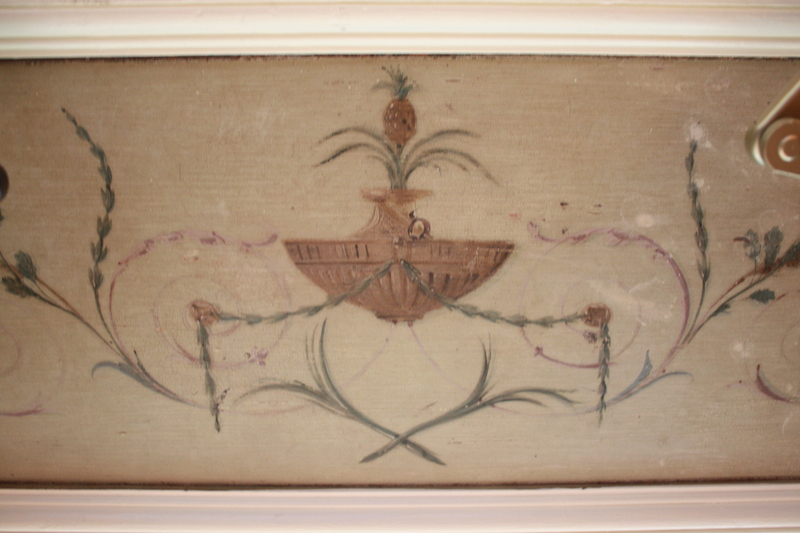 Now that phase 1 of the restoration of the chapel is complete the team there are thinking about raising money for phase 2. 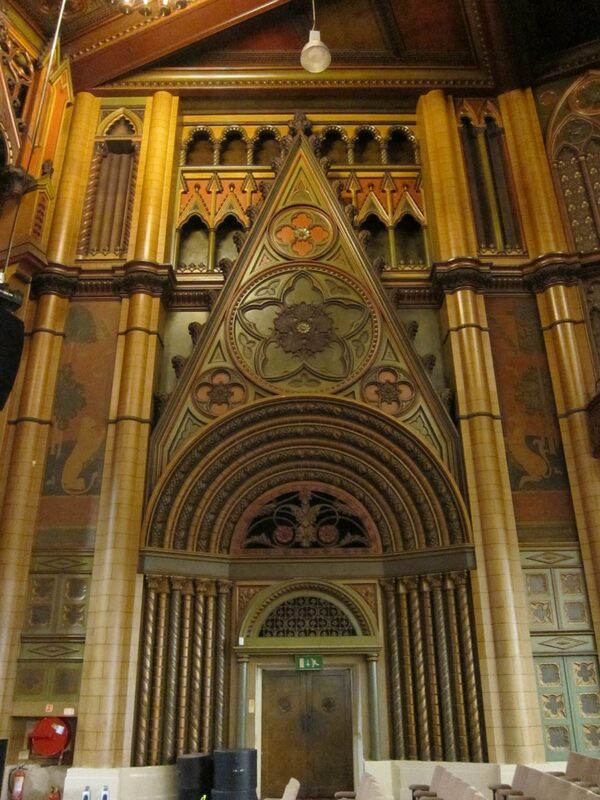 They are keen to replace the wooden doors at the entrance with glass doors so that the interior will be visible to passers-by, and further work is needed on the pulpit and altar as well as the other mosaics. 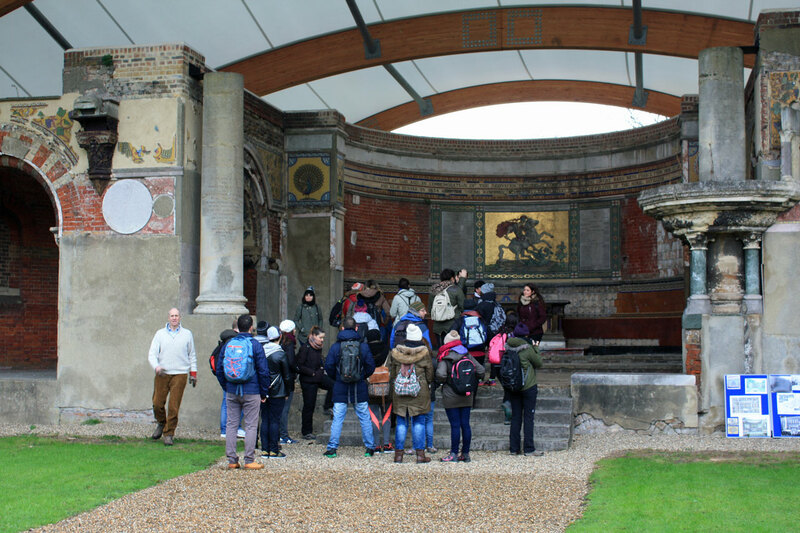 Public access and use of the chapel is important, and from the start of the year it has been open every Sunday from 10.00am to 1.00pm, with help from a team of volunteers, and it is planned to open for longer when the weather improves later in the year. Volunteers will be key to the future of St George’s, and Julie will be talking about volunteering opportunities at her presentation on Thursday. It should also include some of the marvellous photographs of the garrison church in it’s heyday. 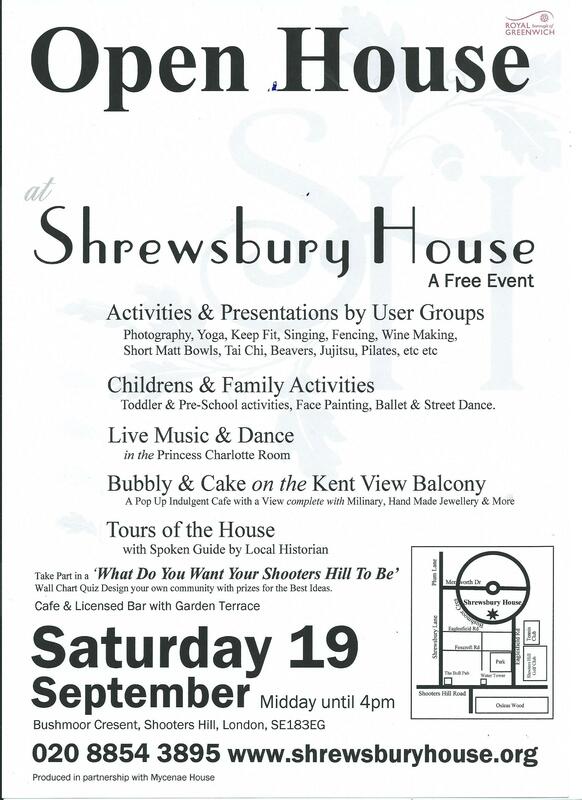 Well worth a visit to Shrewsbury House. 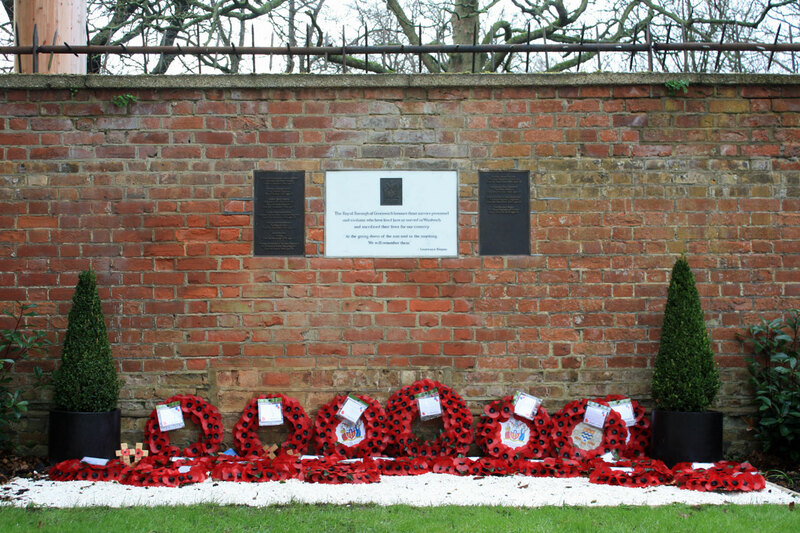 A memorial to recognise the sacrifices of all soldiers based at the Woolwich Barracks, as well as civilians, who died as a result of military activity or conflict will be unveiled at St. George’s Garrison Church tomorrow, 11th November 2015. 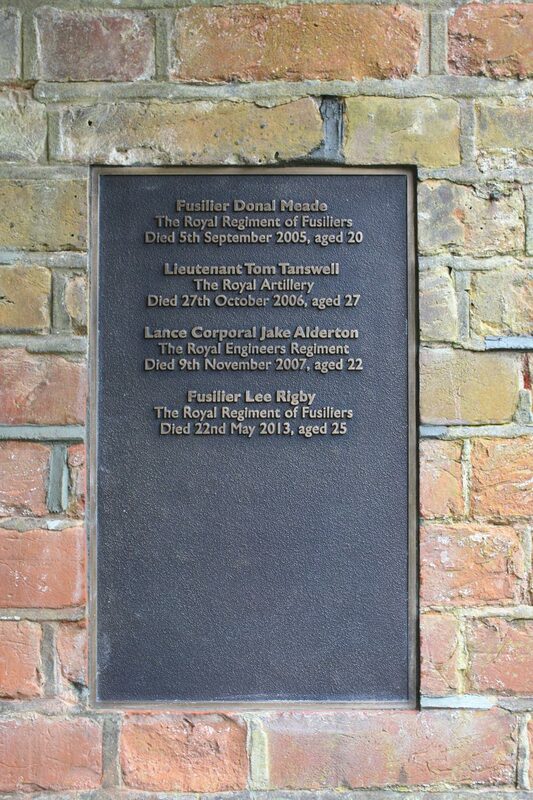 The names of 10 soldiers and one civilian, including that of Fusilier Lee Rigby, are listed on the memorial plaques. Lee’s mum, Lyn Rigby and her family will attend the ceremony. 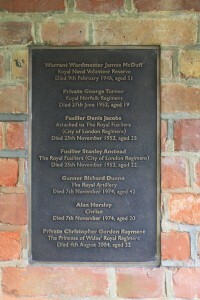 The ruin of the Garrison Church seems a very appropriate place for such a memorial, which is mounted in the wall at the right hand side of the peaceful garden. 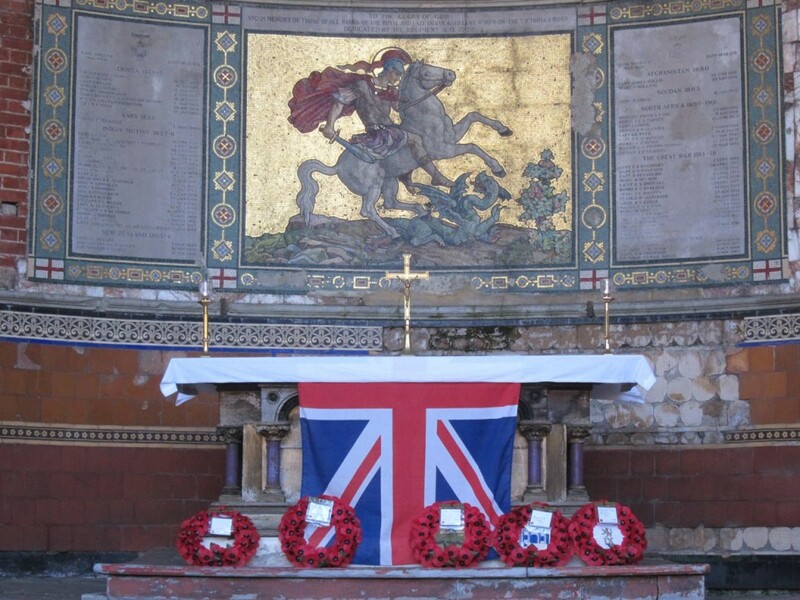 The church also contains other memorial plaques and the Victoria Cross memorial with its recently restored marvellous mosaic of St George and the Dragon, and the names of all the Royal Artillery personnel who won the Victoria Cross from the Crimean War to the middle of the Second World War. 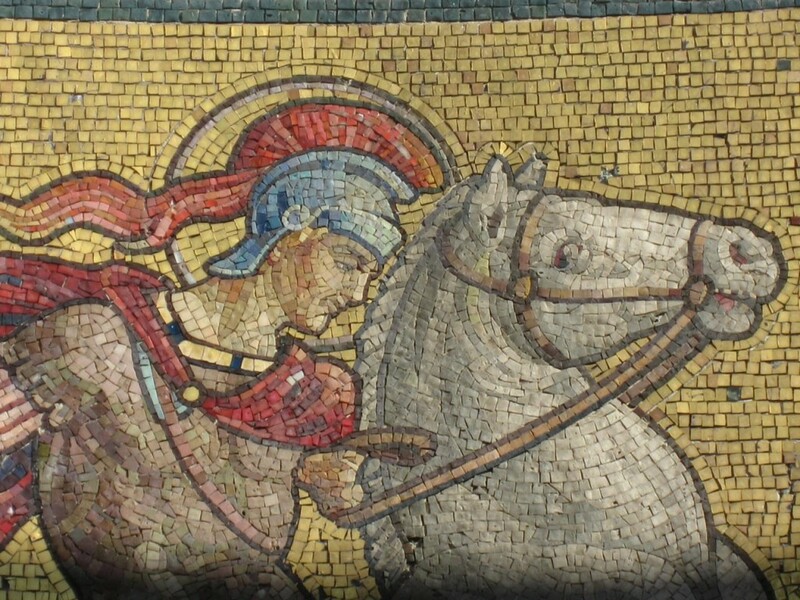 Greek mosaic specialist Kalypso Kampani and her team of conservators expect to complete the current phase of mosaic restoration work at St George’s Garrison Church by the middle of July. The marvellous mosaics, which were installed by Antonio Salviati around 1870, include the Venetian glass mosaic of St George and the dragon, part of the Victoria Cross memorial. 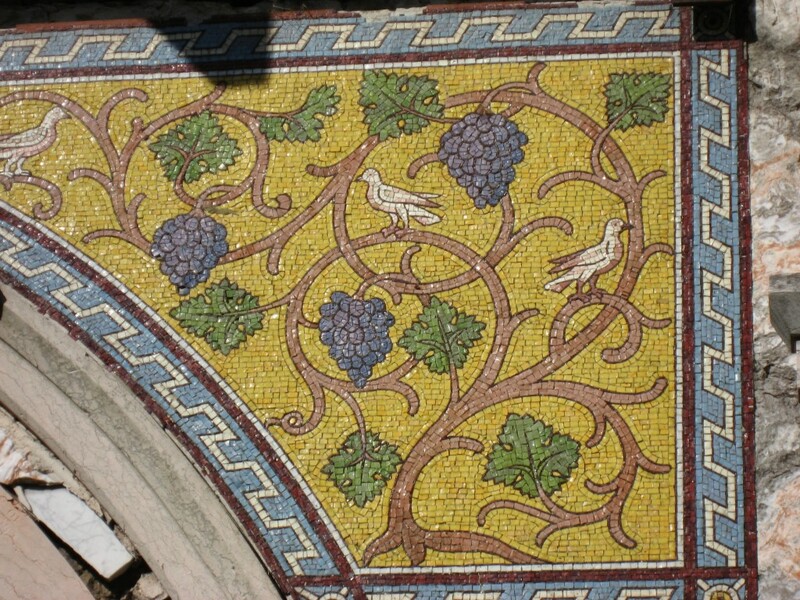 Kalypso’s team come from historic building repair and restoration specialists, Skillingtons who won the contract for the restoration of the mosaics in late 2014. There was standing room only on 9th May in the meeting room at Woolwich Library for the presentation about St George’s Chapel. Julie Ricketts who is the Heritage Project Officer responsible for the St George’s project gave an interesting presentation. 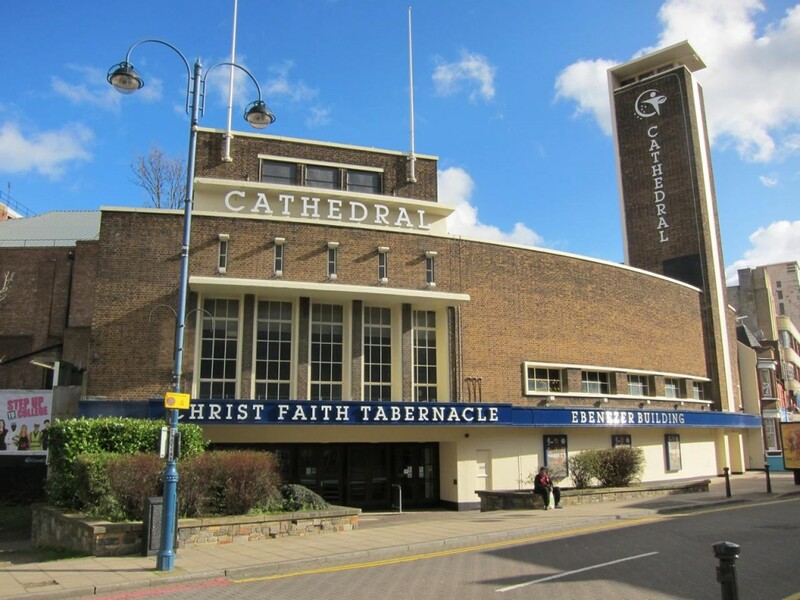 She talked about the history of the Garrison Church and showed some old pictures of the church before it was partially destroyed by a V1 flying bomb, with some I hadn’t seen before of the 1500 capacity interior. I was also unaware of the extent to which cast iron was used in the construction of the church: there were cast iron pillars and iron was also used for the roof and balconies structures. Cast iron column capitals can still be seen in the ruin today. 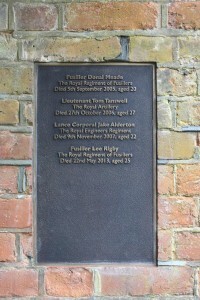 The Heritage of London Trust Ops. 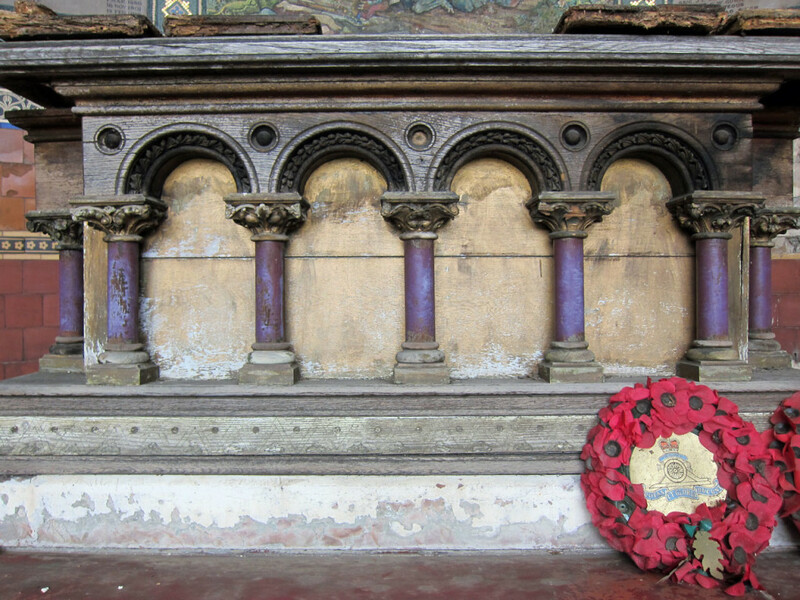 has been working on a restoration project at St. George’s, with funding and assistance from a variety of sources: Ministry of Defence, Royal Artillery, HLF, English Heritage, John Paul Getty Foundation, Community Covenant Fund, Pilgrim Trust, Cory Landfill, Lord Ashcroft, Foyle Foundation and VC and GC Associations. Julie’s presentation also gave details of the on-going restoration work and the plans for the future of the chapel. 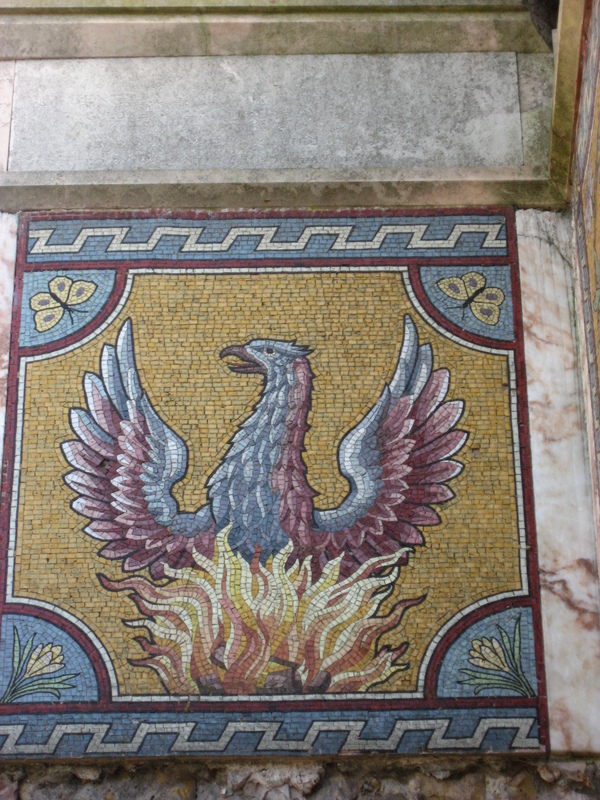 There are two aspects to the first phase of work on the mosaics by Skillingtons’ team. 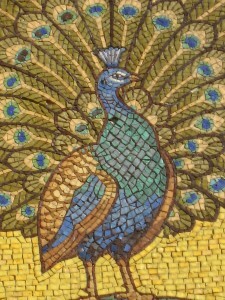 The mortar backing on many of the smaller mosaic panels needs to be replaced. 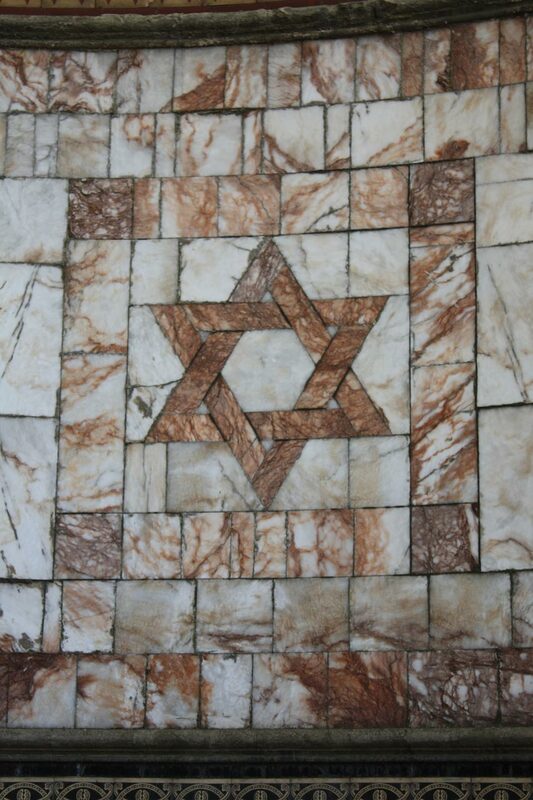 Those panels were removed from the chapel after fixing the mosaic tesserae in place by attaching muslin cloth to them using a glue made out of rabbit skin. Then the mortar between the tesserae is replaced from behind in the workshop, following which the panels are replaced in the chapel. 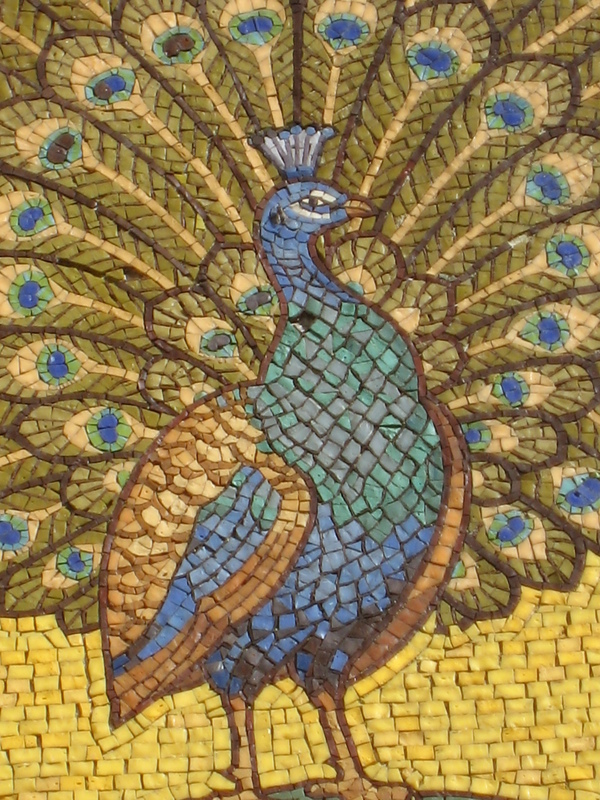 In this phase missing parts of those mosaics are not being renewed; it is hoped this might be done in a future phase if funding is found. 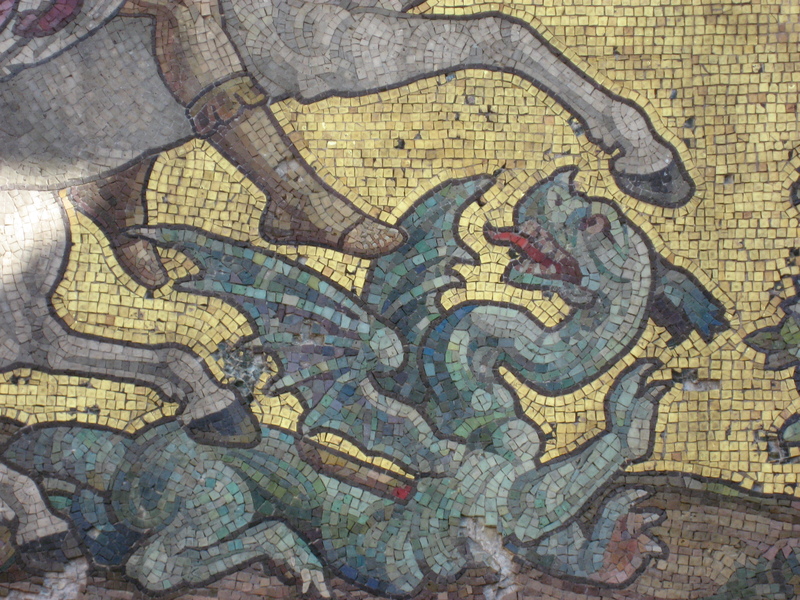 Missing parts of the St George mosaic are being replaced in situ in the chapel. 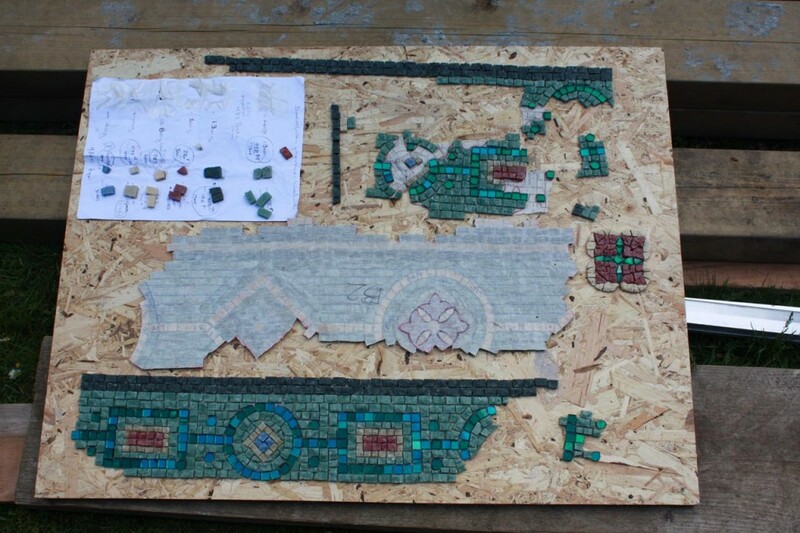 Missing sections are created, as shown in the photograph above, using new tesserae which are made by a producer in Greece. 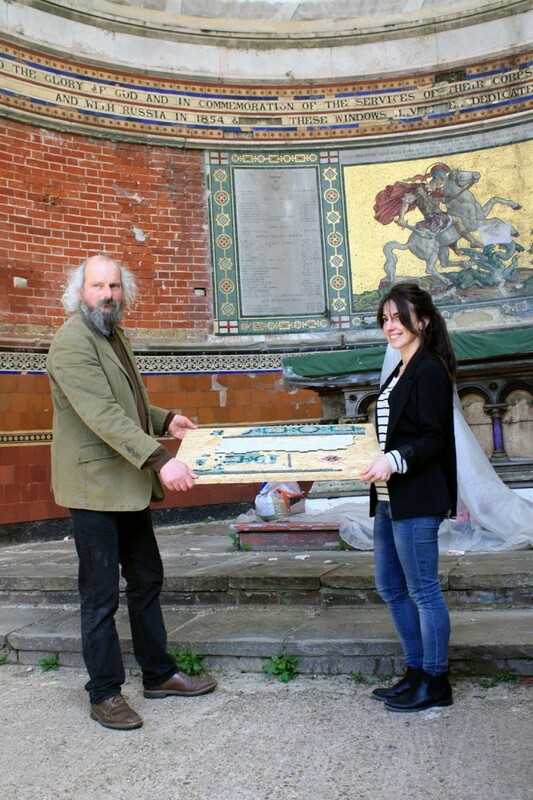 As well as the mosaic the letters in the marble tablets inscribed with the names of the deceased gunners who won the Victoria Cross from the Crimean War to the middle of WWII are being restored. 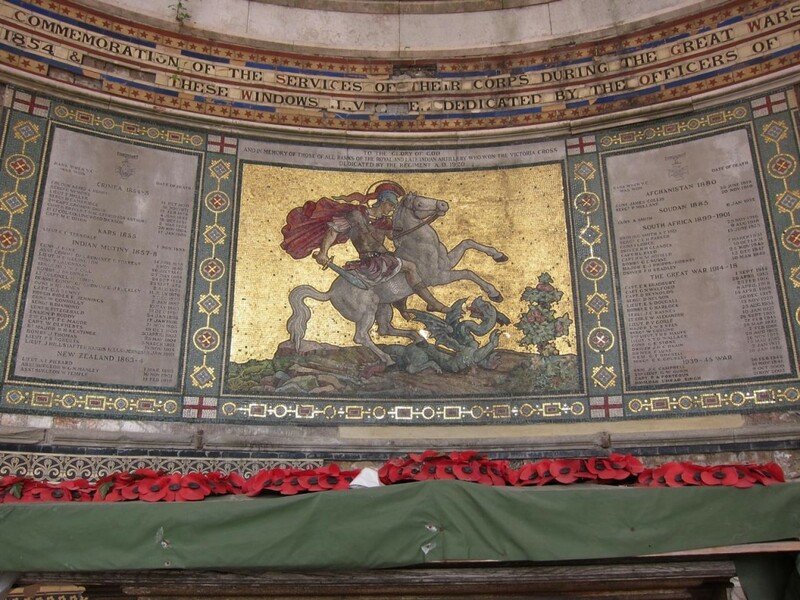 The conservators are concerned about the stability of some other memorial panels in the chapel, especially the alabaster panel shown below which is to the right of the St George mosaic. 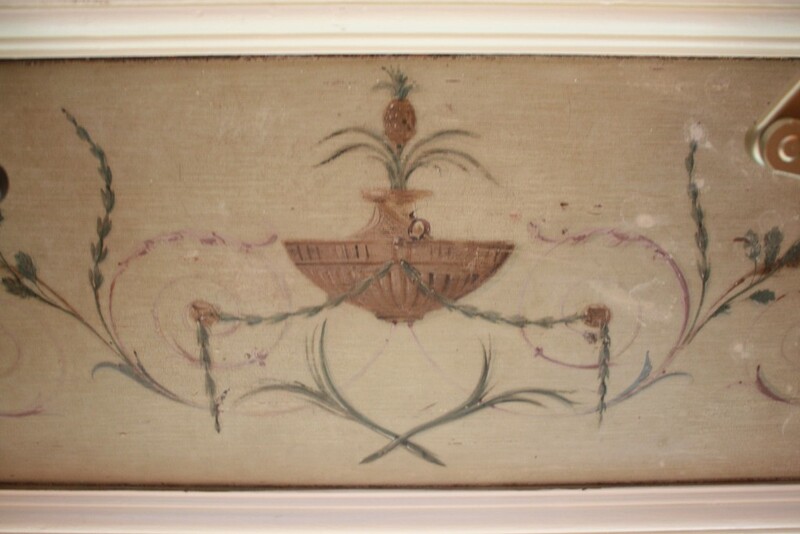 There has been a request for emergency funding to ensure this panel doesn’t deteriorate further. 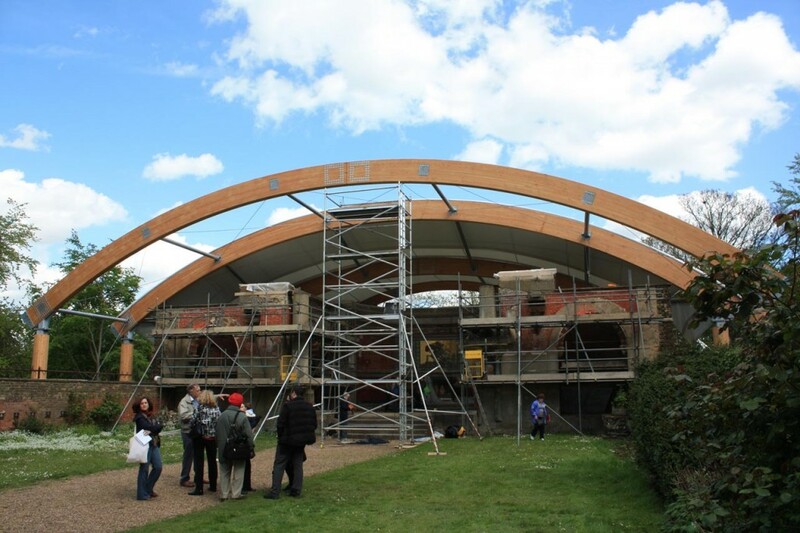 After the presentations we all walked up the hill to the chapel where the new tensile fabric roof was being attached to the glulam timber-framed arch. The tensile roof was constructed by Fabric Architecture, with Thomas Ford and Partners as the conservation architects for the project. 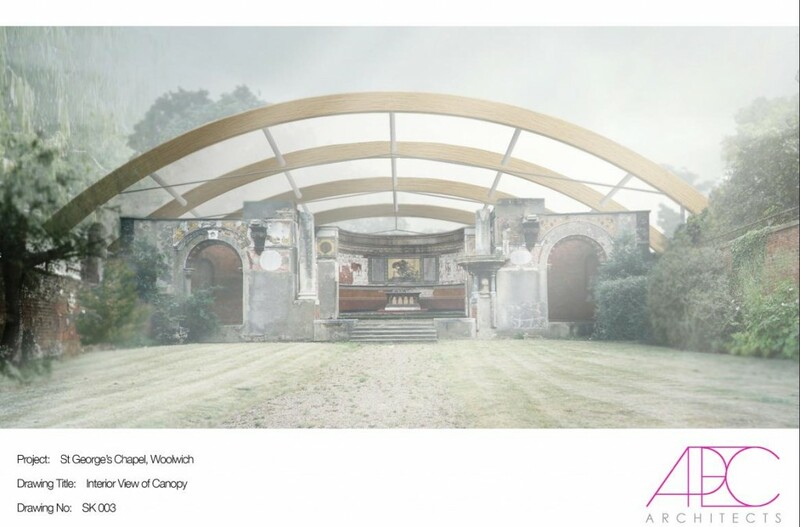 There’s much more detail about the project and photos of the work progressing on the Fabric Architecture website, for example: the main vaulted roof beams each weigh around 6 tonnes and they sit atop 8 supporting columns weighing around 750kg each. It had been expected that the roof would be in place in time for our visit, but completion was delayed by strong winds. Resisting strong winds was an important factor in the design: the structure’s foundations need to be strong enough to prevent the roof being blown away as well as supporting the glulam framework. What will happen to St Georges once the work is complete? Whilst the chapel will remain a consecrated place, there are plans to make the space available for community group events and school visits. 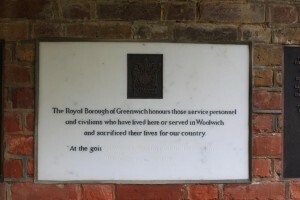 Current ideas include concerts by the Royal Artillery Band, Greenwich University Big Band and Woolwich Singers and services for local veterans organisations and the Woolwich British Legion. 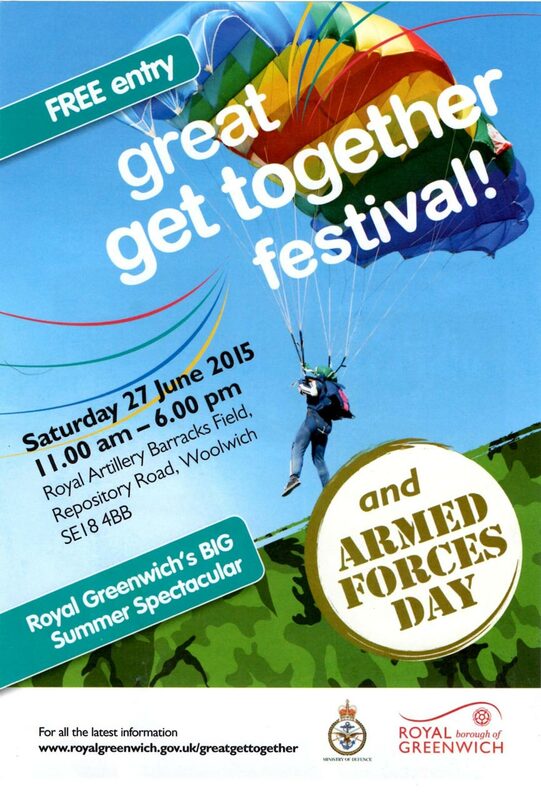 Julie is looking for volunteers to help for a couple of hours at the Greenwich great get together/Armed Forces Day festival on the 27th June to “greet members of the public at St. George’s Garrison Church, give out an information leaflet, ask them to sign the Visitors’ Book and shake a collection bucket!” You can sign up for this using an online calendar or by contacting Julie Ricketts by e mail: hpostgeorgeswoolwich@gmail.com or telephone 0754 6265480. In the longer term Heritage of London are setting up a friends group to look after future events. Volunteers are sought, for the following areas: Events, Finance, Membership, Education & Outreach, Building & Gardening, Publicity, Media & Communications and Fundraising.If you’re interested contact Julie using the contact details above. St George’s chapel is also on Twitter and on Facebook. The restoration of the Garrison Church was originally agreed before the 2012 Olympics, so it’s been a long project, but its looking like it will have been worth the wait. 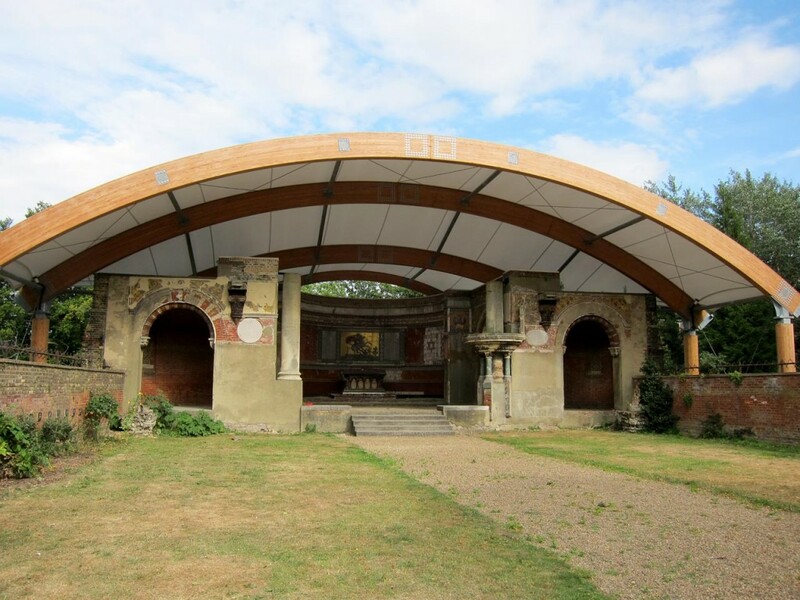 Learn about the restoration project at St. George’s Chapel, Woolwich and plans to return it to community use. Find out how your community group can use the venue. Take part in Heritage Open Day and Armed Forces Day. Discover our range of volunteering opportunities. 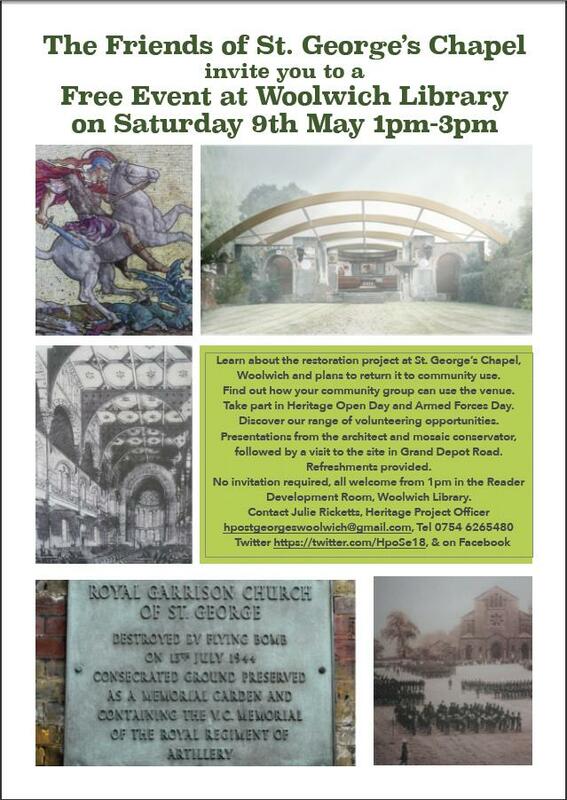 Presentations from the architect and mosaic conservator, followed by a visit to the site in Grand Depot Road. Refreshments provided. I understand that the plan is to set up a friends group for the chapel and make it available to community groups. 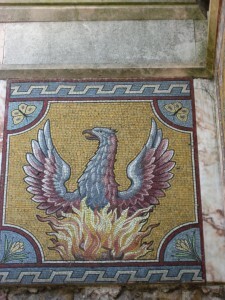 Should be an interesting afternoon, I’m really looking forward to learning more about the restoration of the mosaics.